Topic: MOLLE dog backpacks. Need large pouch recommendations? Re: MOLLE dog backpacks. Need large pouch recommendations? The ALICE type buttpacks can be made to work with MOLLE. Topic: Where to find multicam sustainment pouches? Re: Where to find multicam sustainment pouches? Topic: Tower question: windfall or boat anchor? Re: Tower question: windfall or boat anchor? Or make 3 40' towers out of it. Ok. Here's a heck of a rarity. Uncle Sam's Retail Outlet has some brand-new, military issue, CFP-90s with the Patrol Packfor $99.99 with free shipping. This property has been sculpted by history and industry and has been the home to Dave Canterbury's, from Discovery Channels Dual Survival, Pathfinder Wilderness Survival School. Topic: Broadcast TV on your Apple device. Re: Broadcast TV on your Apple device. Unfortunately, this device only receives broadcasts from the Dyle TV service which has very limited, US only coverage. Topic: recommended MRE source? Trays any good? Re: recommended MRE source? Trays any good? Today only, Uncle Sam's Retail Outlet has brand new 4-pc Modular Sleep Systems for $99.99 + tax and shipping. It's not specified, but when I ordered mine a few years back, the components were still in the original packaging from the manufacturer. Today only (3/13/14), Uncle Sam's Retail Outlet has brand new Large ACU Field Packs with frame for $80. This includes the main pack, the frame, two sustainment pouches, the waist belt, and shoulder straps. Uncle Sam's Retail Outlet has sets of two, brand new, USMC Mac Sacks for $14.99. Here's an overview of the Mac Sack. Handy items to have, especially if you are making a modular BOB/INCH/etc. Topic: Russian soldiers in Crimea wearing wool? Re: Russian soldiers in Crimea wearing wool? I seem to recall that USN subs surfacing in the Arctic use(d) M14s for polar bear watch. Topic: Better waistbelt for MOLLE frame? Re: Better waistbelt for MOLLE frame? I don't have one myself, but the FILBE/USMC pack waist belt should be MOLLE compatible (FILBE uses the 1606AC frame) and looks to have much better padding than MOLLE or ILBE. Topic: What color paracord is this? Re: What color paracord is this? The current issue is darker and the individual colors are more distinct. 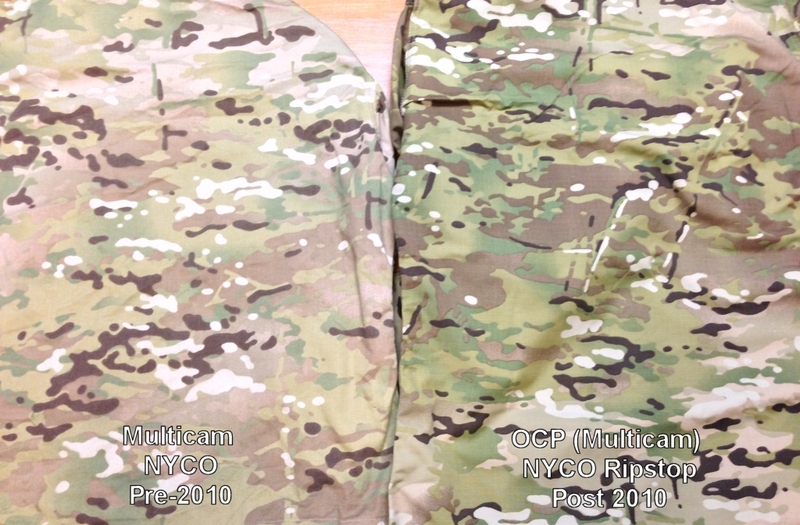 There's also a color difference between early MultiCam and current issue OEFCam.